digital=photos. flickr photo test #29299238884.
vinyl=did you see the sneaky little link below? james posted a link to our record collection. it does load. it does take time. you can see our record collection. but it is a bunch of fun and funny and badass and awesome records. james just won me some new old cocteau twins records on ebay yesterday. some of which i already owned but for the price! it was an awesome deal to get the ones i didnt own. and james and i also bought some new records the last few days that arent on that list yet. including the wham! bad boys single. aaaaaaaaah! 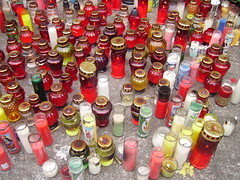 the photo above is an old photo that appears on my wordpress bloggerella page and that posts! but when i click refresh to bring up newer pictures from flickr it says “sorry, no photos found!” aaaaaaaaaaaaaaaaaaaaaaaah! help, please. happy birthday to laura. happy birthday to danny pinto. happy birthday to chris corey. and happy birthday to you. i cannot post photos. its been like this for 3 days. i wanted to post a happy birthday to chloe photo…but no dice. she turned 5 on tuesday. and is cute as ever and even more fun as a kindergartener! kisses for chloe. or go to flickr for photo fun. sir william and his forest painting. i dont have a photo of the finished painting yet! but i will take one soon. there is still time to see it hanging @ Laila Lounge. 113 N 7th St Brooklyn, NY (718) 486-6791. generally they open @ 6pm on weekdays. you have until saturday to go see it. (the painting comes down on saturday). and yes, sir william, made it into the painting. come see my new (not even finished yet) painting. this saturday doors @ 6pm. laila lounge N7 near berry, williamsburg, brooklyn, ny, usa. cant wait to see you. and there is a cover of some sort. it shouldnt be more that a few bucks…but it includes a bbq. so keep the summer going in the nice back garden, with lots of tables. holy moly! i tried to make a new dish for brunch earlier today and the results were pretty unusual to say the least. 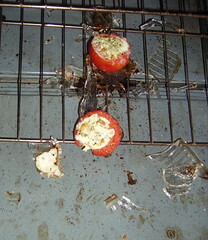 i was making baked tomatoes and eggs. 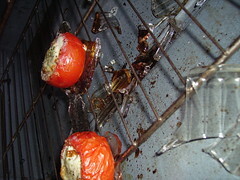 the recipe called for a 425* oven, preheated, and scooped out tomatoes filled with herbs, parmasean and eggs. i used a pyrex baking dish and everything was going fine. 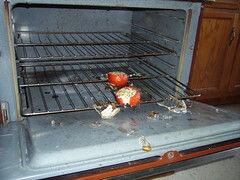 after 20 minutes i went to take the pan out (i was going to remove one tomato and put the other back in to cook longer). 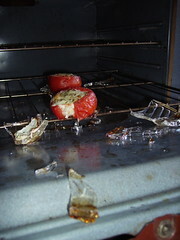 i put on my handy dandy silicone glove oven mit thingie and pulled the oven rack out and when i went to grab the pyrex dish the entire thing exploded in my hand and all over the place, filling the entire oven with glass. the kitchen was filled with flying bits of glass too. it totally freaked me out! against all odds and in spite of my spazziness i wasnt hurt.